Though Bari is a thoroughly Italian restaurant, it’s not the sort of place to go expecting pizza and spaghetti. The menu’s hyper-regional focus on food from Puglia means that their dishes are a little more surprising (and much lighter) than more typical Italian food. The menu has the dishes broken up into courses, with the idea that people will order something from various courses, a la carte style. The plates are small and inexpensive (with the exception of the meat courses, which range from $15-25). You can eat just a little bit, or, you can do what I did and eat a little bit of everything. I started with two cheeses from Bari’s impressive list of more than 4o Italian cheeses and some salami. I wish I had written down what I ordered, because all I can tell you about my cheese is that one was hard and tangy (like an Asiago) and one was semi-soft, tart and a little stinky. 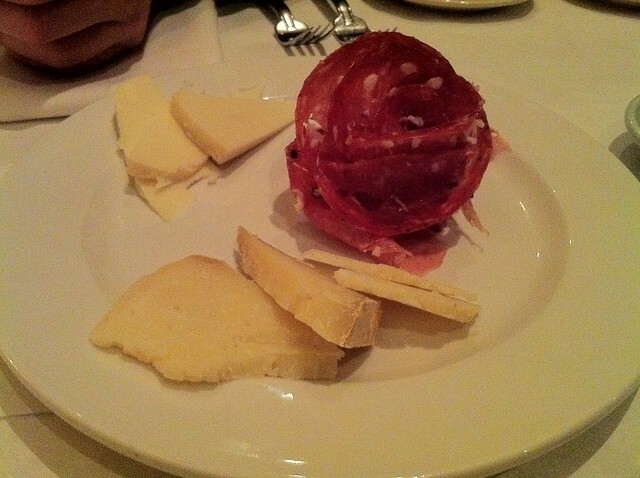 The salami slices were sculpted into an impressive rose, and there was plenty of each cheese to share. I also had a Lattuga salad, which was a bed of buttery greens topped with nuts, creamy goat cheese and grapefruit slices. The dressing was sweet and a little smoky. I may or may not be daydreaming about it right now. 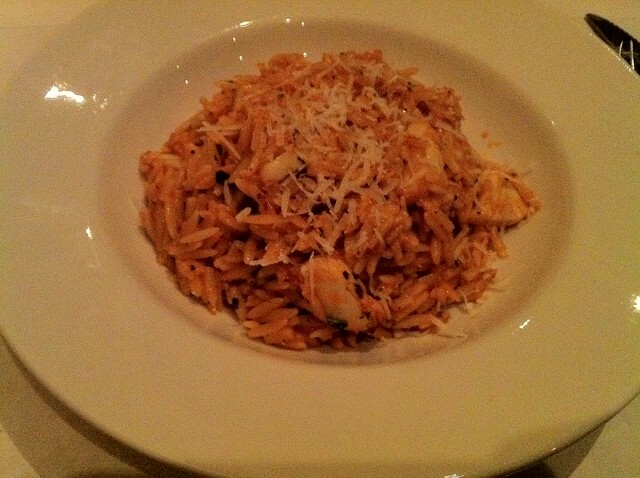 For dinner, I got the Orzo Pomodoro. The sauce was tomato-based, but not overwhelmingly so. It had some bite to it (as a result of the pepper), but it contrasted beautifully with the chunks of sweet lump crab meat. Bari’s dessert menu is short – there are maybe five options – but it’s pretty awesome. I had the apple semolina cake, which is perfect if you want something that’s sweet, but not entirely too saccharine. The restaurant is cozy – it’s the perfect spot for a date or special occasion dinner. For those of you who don’t eat meat, there are plenty of vegetarian and vegan options on the menu.You can eat at the bar or in the small dining room. Because the dining room is small (it seats maybe 20 people), I highly recommend making reservations, especially on Thursday, Friday and Saturday nights. I love this place. So glad the word is getting out about it. Looks pretty good. I’ve been tempted to try this place out for a while.